Interested in reducing your need for glasses and contact lenses? Laser Vision Correction, which includes LASIK and PRK, can provide safe and effective treatment for your refractive error. Why use the term Laser Vision Correction? The surgical correction of refractive error is a complex process, and the decision of which procedure to perform may include LASIK, PRK, phakic lens implants, and refractive lensectomy–and even other procedures. Narrowing down your options too soon may result in a suboptimal result. At Empire Eye and Laser Center, Dr. Daniel Chang will perform a full Refractive Consult and consider all of the possibilities before determining which procedure would be the best for you. At Empire Eye and Laser Center, we use the most advanced systems to deliver the best outcomes possible for our patients. With the IntraLase FS laser, Dr. Daniel Chang completes an all laser, blade-free LASIK procedure. Known as iLASIK, this same procedure is approved by the United States Navy for our high-performance fighter pilots and by NASA for our nation’s astronauts. Click on a link below to find out more how LASIK and PRK can help you to a lifestyle of less dependence on glasses. Laser In Situ Keratomileusis, most commonly know as LASIK, is the most common surgical procedure for correcting nearsightedness, farsightedness, and astigmatism. Because of its safety, stability, and quick visual recovery, millions of people undergo LASIK every year. Your cornea, the clear dome that overlies the colored part of your eye, is responsible for approximately two-thirds of your eye’s light focusing ability. When the shape of your cornea does not match the length and shape of the rest of your eye, you have refractive error, such as nearsightedness, farsightedness, and astigmatism. Glasses and contact lenses are effective in correcting these refractive errors, but each have their limitations and shortcomings. At Empire Eye and Laser Center, we are committed to the best surgical results with the best quality of care. Dr. Chang understands that even when performing LASIK with the most advanced lasers and technologies, meticulous attention to detail is still of utmost importance. Starting with your initial Refractive Consult, Dr. Chang will go over your visual goals and expectations. He will carefully explain the entire process to you in words that you can understand, and he will give you ample opportunity to ask questions. Dr. Chang believes that good patient-surgeon communication is the cornerstone of a positive and memorable surgical experience. Dr. Chang and his staff will perform multiple measurements of your eye in the course of your consults, and he will carefully examine your entire eye to ensure that you will have an excellent result. He will assess the stability of your refraction and determine your current refractive state. Dr. Chang (a former math team champion on the state and national levels) will personally check and double check (and triple check) your measurements, so you can rest assured that the correct treatment will be performed on your eyes. Because of his attention to detail, Dr. Chang provides all enhancements for a full year completely free of charge. Dr. Daniel Chang performs LASIK with the VISX Star S4 laser with Iris Registration, the most advanced laser technology platform available today. All this means precise outcomes and peace-of-mind. The VISX Star S4 laser is being used at the U.S. Naval Medical Center to treat Naval aviators–the “Top Gun” pilots who need superior vision to make aircraft carrier landings. If you are interested in scheduling a FREE LASIK consultation please email or call us at 661-325-EYES (3937). Photorefractive Keratectomy (PRK) is the original Laser Vision Correction procedure for nearsightedness, farsightedness, and astigmatism. Also known in various forms as LASEK, epi-LASIK, and Advanced Surface Ablation (ASA), the highly precision laser is focused on the surface of your cornea, eliminating the need for creating a corneal flap. Although PRK has been around for a while, don’t let the name fool you–PRK has undergone many changes and advances in patient comfort and surgical outcomes, making it a generations better than the original procedure performed in the 1980’s and ’90s. After some mild oral sedation, you receive a topical numbing eye drop. You are positioned under the laser, and your eyelids are gently held open, so you don’t have to worry about blinking. 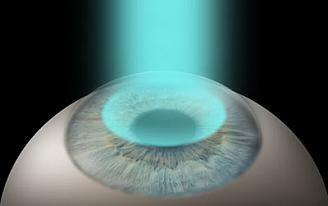 The surface epithelial cells are quickly removed, and the laser is locked onto your iris. In seconds, the laser reshapes your cornea to the desired curvature. Medications and drops that prevent pain, infection, scarring are then placed on your eye followed by a soft bandage lens. No eye patch and no eye shield are needed. You are in and out of the surgical suite in less than 15 minutes. The laser is an 193 nm Excimer Laser, a highly precise “cold” laser, your cornea is reshaped 0.25 micron–that’s 1/4000th of a millimeter or 1/100,000th of an inch–per pulse! Such incredible precision allows for great flexibility and customization for each eye of each patient. Coupling this with advanced wavefront technology, you can truly have a personalized treatment. Dr. Daniel Chang performs PRK with the VISX Star S4 laser with Iris Registration, the most advanced laser technology platform available today. This state-of-the-art fourth-generation laser employs Variable Spot Scanning (VSS) and Variable Repetition Rate (VRR) to deliver beam sizes from 0.65 mm to 6.5 mm at varying repetition rates, resulting in optimized times. 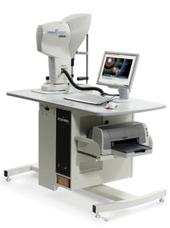 Additionally, ActiveTrak 3-D Active Eye Tracking with Iris Registration captures all 3 dimensions of intra-operative eye movements and uses the structure of the iris to provide cyclorotational and centrational alignment. All this means precise outcomes and peace-of-mind. No wonder the VISX Star S4 laser is being used at the U.S. Naval Medical Center to treat Naval aviators–the “Top Gun” pilots who need superior vision to make aircraft carrier landings. At Empire Eye and Laser Center, we are committed to the best surgical results with the best quality of care. Dr. Chang understands that even when performing PRK with the most advanced lasers and technologies, meticulous attention to detail is still of utmost importance. Starting with your initial Refractive Consult, Dr. Chang will go over your visual goals and expectations. He will carefully explain the entire process to you in words that you can understand, and he will give you ample opportunity to ask questions. Dr. Chang believes that good patient-surgeon communication is the cornerstone of a positive and memorable surgical experience. Dr. Chang (a former math team champion on the state and national levels) will personally check and double check (and triple check) you measurements, so you can rest assured that the correct treatment will be performed on your eyes. Because of his attention to detail, Dr. Chang provides all enhancements for a full year completely free of charge. If you are interested in any of our services, call us at 661-325-3937 to schedule an appointment.